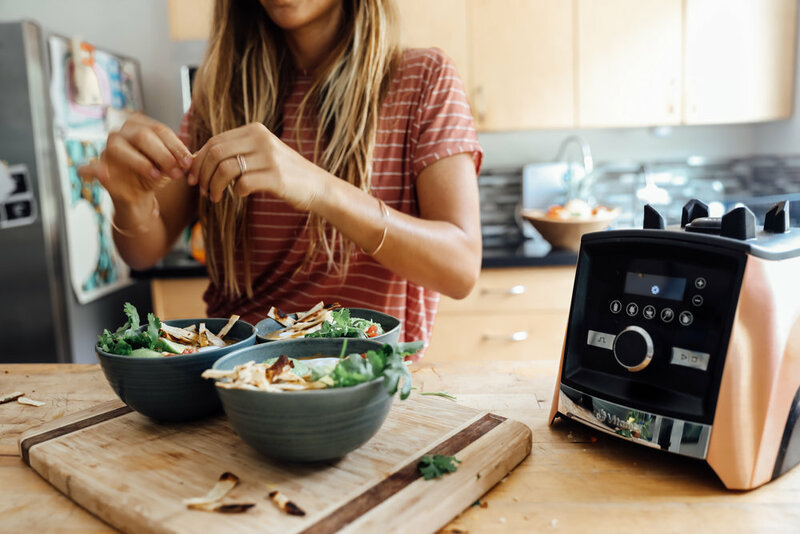 In the spirit of Mother's Day I’ve partnered up with Vitamix to share how our family uses time in the kitchen to connect through creating simple recipes. Growing up I always had an interest in cooking in the kitchen with my mom. My mom (Sheila) was always so sweet and patient with me in the kitchen and took the time to create with me and teach me. I love her for this reason and I am grateful for her. Now that I am a mother it’s important for me to spend time in the kitchen with Tama and Ira to teach them about food and how to create with it. Making simple recipes in the kitchen with the kids gives me a chance to connect in a fun and different way. Of course we love the beach and outdoors but doing something where we are creating together I get to learn fun little things about the boys. Ira is so inquisitive right now and is always asking where different things come from and what they are made of, from potatoes to mangoes he's just so curious. Tama is on texture control, he ensures whatever we are making is mixed right and just as important tastes right :) The time we spend in the kitchen gives me the chance to know a side of my children that I love discovering with them. Cooking in the kitchen was special to my mother and so it for me to be carrying on that tradition with my children. To celebrate Mother's Day, Vitamix is giving up to $100 off of their blenders along with free shipping (limited to US only)! Click here for the link (HERE). 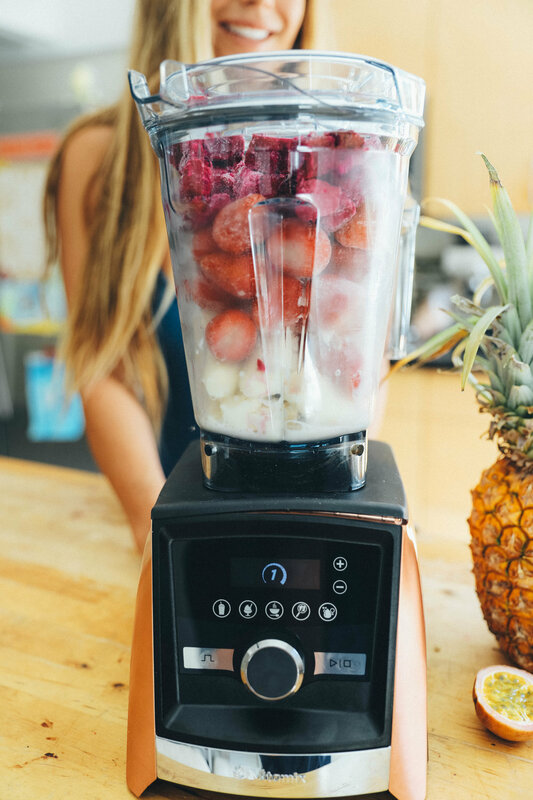 As you all know, we love creating with our Vitamix. We have the A3500 and it works great because of the powerful motor and large pitcher size. We always make enough in one pitcher to feed our little family and usually the 3-4 other kids hanging outside the door like puppy dogs waiting for a bite! This past weekend me and the boys whipped up a simple soup in our Vitamix that takes less than 15 minutes to make and there is no oven or stove involved! The boys and I made Veggie Tortilla Soup with a dollop of coconut yogurt, lime and fresh cilantro. In your Vitamix put in the tomato, vegetable stock, celery, carrots, garlic. Blend on low for about 30 seconds then adjust speed to high and blend for 6-7 minutes or until hot. If you have the A3500 then you can choose the soup setting, the blender should automatically turn off after that time frame. Once the mixture is hot add in cilantro, spinach, lemon juice and tortilla chips and blend on level 3 for 30 seconds. 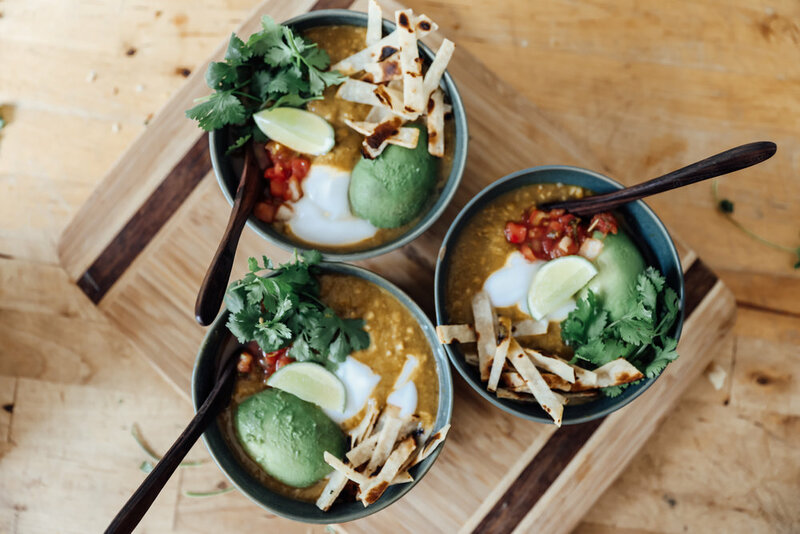 Serve with a dollop of unsweetened coconut yogurt, fresh avocado slices, fresh chopped cilantro and a lime wedge. I want to wish all women a happy Mother's Day whether or not you have kids. Chances are there is a little boy or girl that looks up to you for the love that you show them and for being the person that you are to them and that is what being a mother is all about. Happy Mother's Day! “HOW DO YOU GET THE THICKNESS IN ACAI BOWLS & NICE CREAMS?” Today I am going to answer that question and do the breakdown of how to achieve that amazing, creamy, thick, delicious, dreamy texture that might be easier than you expect. I have partnered up with Vitamix to showcase how one can easily achieve soft serve ice-cream texture with their smoothies and showcase their newest model, the goddess of all blenders…the a3500! Side-note* If you're looking to purchase any of the Vitamix models click HERE for $50 off the a3500 Vitamix with a COPPER FINISH. Side-side -note* I have used Vitamix for the past 11 years! Shem and I have had one since we’ve been married, needless to say I am a fan. We use our blender multiple times a day making smoothies, nice creams, soups and sauces. Its makes preparing healthy foods for myself and for my family quick and easy and also just as important super delicious! The Right Ingredients: For ultimate thickness & creaminess, it is important that all of the fruit you are using is completely frozen and that your ‘base’ is a creamy fruit like frozen banana, avocado, or mango. Extra tip: Freeze your favorite nut milk (almond, cashew, coconut) into cubes for a non fruit alternative! *full fat milks work the best for flavor and texture. INGREDIENT RATIOS: Do not add too much liquid. Notice in the image below how little liquid is at the bottom of the blender. The more powerful your blender the less you can use. Many times I use no liquid at all. You can always add more if needed. Extra tip- instead of a liquid, try a non frozen fruit like banana, strawberries, blueberries or mangos. Add to blender first and frozen fruit on top. The non-frozen fruit will puree and help get things moving! Blender Speed: For this particular blender you can use presets. Its completely fool proof. For Nice Creams and thick Acai Bowls use the Ice Cream preset. Simply, turn power on, press the ice-cream button and let it do its thing. You can always adjust how you see fit during the process and use the Vitamix Tamper (I call it a wand) to help move the fruits around. This machine comes with a 64 oz container with blades that are designed to draw the ingredients into the center. Blend, Stop & Mash Repeat: I’ll stop blending once or twice just to scrape the side and to avoid blending too much. The entire process of blending should take 1-2 minutes tops! Finish Product: The thickness should be equivalent to serve ice cream! If you were to turn the blender upside down it will stay in place! OR stick a spoon in it and it will stand up straight! That’s when you know you nailed! There you have it! Its quite simple and takes only a few minutes once you know what to do! Even my young kids have fun creating their own recipes and making the family treats! What we do at home to make healthy options easy is to stay stocked up and in this particular case we would have in our freezer a few big bags of organic frozen fruits (i.e. blueberries, bananas, strawberries, mangos) and frozen nut milk ice cubes. We would have some other fresh fruits in the fridge and in our cupboard we always have granolas, coconut shreds, and some other fun toppings like crushed nuts and dried fruit or cacao nibs! It makes it fun to be prepared and creating healthy delicious dishes that much easier! I hope this break down helped and if you have any questions feel free to ask!